The easy-to-use ConcreteCalc Pro concrete calculator helps reduce material waste, improve design accuracy and cut estimating time. Increase efficiency in the field or in the office with fast, accurate solutions for Square-ups, Loads, Area, Volume, Rebar, Drop, Stairs and much more. Tackle concrete and paving projects with confidence using the ConcreteCalc Pro calculator from Calculated Industries. Designed specifically for concrete and masonry professionals, this concrete calculator lets you work in and convert between different measurements, as well as calculate areas, volumes, square-ups, loads, rebar sizes, drops, stair layouts, and more. 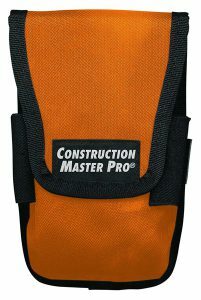 The ConcreteCalc Pro can also serve as a standard math calculator and comes with a slide cover for added protection. Great for professional masons and concrete layers, the ConcreteCalc Pro allows you to make precise calculations for construction jobs, helping to reduce material waste, improve design accuracy, and cut estimating time. Using its dedicated length, width, and depth keys, you can quickly determine areas and volumes as well as work in and convert between a variety of measurements, including feet-inch fractions, decimal yards, meters, and more, including square and cubic measurements. It can also provide answers for square-ups, loads, rebar sizes, drops, stair layouts, circular measurements, and other project needs. The ConcreteCalc Pro concrete calculator is equipped with a number of time-saving features, such as a "paperless tape" function that lets you review the previous 20 entries to double-check totals. A Cost Per Unit function helps you quickly calculate unit cost and total pricing. This device can also serve as a standard math calculator. All of our superintendants love using this concrete calculator. Please don't even think of changing it. We also like the orange case. My husband needed this calculator for work. It's accurate and durable thus far. He uses it daily and it's holding up pretty well. It arrived on time. I bought my first concrete calculator in the early 90's. It does everything and I need quickly and accurately, who could ask for more. I could price my jobs and order concrete without it, but I WON'T. I have two of these calculators and they are very accurate and make my job easier. 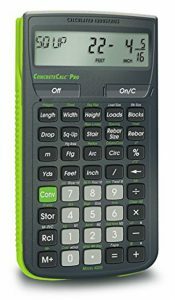 I am a concrete finisher this calculator works great. If your bidding on a hob this will help you figure things out a lot quicker than doing it on paper. This is my second Calculated Industries concrete calculator but my first Concrete calc. 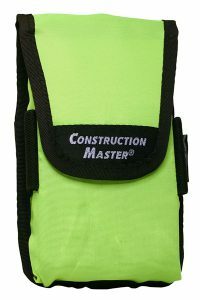 Because I used my first Construction Master for so long and it did not have trade-specific features like figuring rebar, I tend to use my old workarounds out of force of habit. But, someone younger in the concrete business would use those often. The major upgrade for me is the Armadillo case which was included on my model. IT allows the calculator to take a lot of abuse. If you are ordering concrete or concrete materials everyday for flat slabs, you probably do most of the math in your head. But, if you pour a variety of shapes or depths, battered walls, or need to do a lot of dimensional work in feet and inches this is worth every penny. This tool really earns its keep squaring rectangles and figuring stairs. It is one of my favorite tools. User: Mark from Peabody Ks. I poured some footings the other day and used my concrete calc pro. When the driver got there, he said i don't think you ordered enough mud and i was trying to figure out what i did wrong. Turns out he was wrong, when we got done, i had about a half a wheelbarrow extra. Perfect!